Pirate Steve came to me and stated that he thought “Force Unleashed is this years Assassin’s Creed.” I can see what he means: it looks lovely, it’s not the lengthiest game you’ll encounter and there is a certain repetition to your actions. But is that a little harsh? This latest instalment in the Star Wars saga is set between Episodes III and IV and reveals the trials of Darth Vader’s secret apprentice, the laughably named “Starkiller”. In order to do his master’s bidding, he force blasts and light sabres his way through the galaxy, with you at the helm, in this RPG hack-and-slash. Combat is the lifeblood of Force Unleashed, and also its greatest strength. It very capably hands you control of all of Starkiller’s force powers in a manner that lets each be executed with ease, enabling the player to string together a variety of combos without having to study a move list as long as your arm. In early encounters you’ll experiment with how exactly each target should meet their fate just to please the new god-like complex you have instilled in your character. Later on, though, variety is a necessity as creatures will face you that have discovered ways of counteracting certain aspects of the force. Set piece boss battles are scattered throughout and prove a test of counter attacks and timing. All are a distinct ramp up in difficulty level, which seems out of character with your progression but do prove satisfying once bested. Visually, Force Unleashed is impressive. Environments are crisp and detailed, but it is the tiny things – such as Storm Troopers resisting force grips by grabbing on to crates or each other, or Millennium Falcons sticking out of a scrap planet – that complete it. Cutscenes must be commended, too; they sport some of the finest facial animation and expression that I’ve ever seen in a game. For all the good points, however, the game failed to make me truly one with the force. It is an incredibly enjoyable hack-and-slash but with linear levels, very little incentive for replay and the feeling you’ve seen everything after one play-through, it falls slightly short of shrugging off Pirate Steve’s observation. There is one thing guaranteed now: I am not voting Labour in the next election. During all my years of voting I have never stuck to one party or one candidate, always making my mark for the party that at the time appeals and promises to do the things that matter to me. Brown’s activity in the financial district, however, has ruled out any chance of me wanting another term of his misdirected leadership. The recent hand-outs to the various banks that are struggling has really riled me. 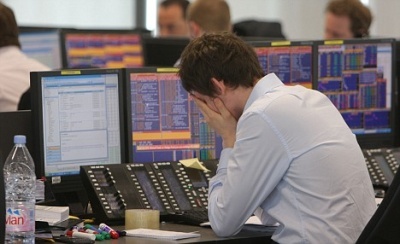 It seems that in this age of capitalism, that sector is immune from the prospect of going under and isoffered blank cheques at the first sign of trouble. Not only did they profit from our money during the good times but they are now looking to use our money to bail them out. Our money is going on propping up failing institutions. If this happened on a smaller scale, say a business you or I had set up, if we had failed then we would have paid for it. Yet in the city, if they fail then we also pay for it. Quite frankly with an insurance and guarantee scheme that already exists for accounts Joe Public’s money that he invested in Braford and Bingley, Northern Rock and Lloyds TSB is protected. I wish I could feel so safe about the multiple billions of pounds our government has just shored them up with. A demo can sell or break a game in the eyes of the undecided masses. The original Viva Pinata demo was awful: too bogged down with pop-ups and explanations to give anyone a true idea of the open nature of the final game. Compare this to the Force Unleashed demo, which so swiftly grabbed my interest in a universe I usually ignore that I actually bought the game day one, and you couldn’t have two more polar opposites in my eyes. There are touches of the Devil May Cry and Too Human about Force Unleashed; you play Darth Vader’s secret apprentice and hack and slash your way through the Star Wars universe, ridding it of any Jedi you may find and wielding lightsabres and force powers as you go. What this game does have over the other hack-and-slash games I have played recently is the ability to challenge you. After the first level that beds you in, the enemies are no walk over and you need to employ your arsenal of combos mix things up and get around their defences. This is opposed to the two games I’ve mentioned where I felt I could get through them in their entirety by just hammering a single button, their combos only being for show. I have already had some immensely satisfying tussles. 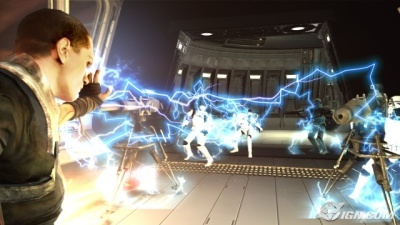 Ignoring the fact that some enemies can resist your force powers at times, you can find yourself blocking enemy swords strokes, countering with a force push to give yourself some space and then finishing them off with a crushing courtesy of a lightning coated droid that you sent spinning across the room. 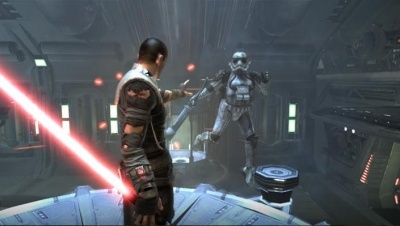 With the variety of attacks and combinations with which you can string them together available, the longevity of Force Unleashed’s combat system may be proven to be a winner. Of course I’m sure I’ve said that before, so we’ll see. There are elements of platforming to keep level traversal interesting and boss battles that you’ll want to just swear (that are also really satisfying when you see them through), but overall things are looking good. Looking back at the events of last week, they drew a range of reactions from people. Some, like myself and Hey Ernie, instantly knew the impact of what had happened. Others, Robot Minion I’m looking at you, simply stared at me as if I was speaking in tongues. During the week, mixed in with a variety of other VP community duties, I received a note from my colleague Hey Ernie wondering whether we could sort his friends at Bungie out with a couple of piñatas. I’m not likely to turn a request like that down, but rather than stop there I decided to show them my appreciation and put together some bespoke Pinata Vision cards. Thus was born scannable versions of a Hooty Fruity Master Chief, a Bonboon Cortana and a Walrusk Sgt Johnson. They appear to have liked them. From the moment I unravelled XO Sancho’s message (“What’s that on your head?”) I became a gibbering fanboy, sitting on Halo’s settings screen staring at my shiny new armour. Previously I had often thought “well, it’s just another toggle, nothing much”, never expecting to get it in my lifetime, but the sense of surprise and elation when I realised what had happened took me aback. Being handed such a gesture by Bungie is a huge deal to my Halo-loving self and completely unexpected. Interestingly enough, the suit does seem to attract teabagging. People hunt you down and take great pleasure in repeatedly crouching over you in a suggestive manner. That said, it’s a small price to pay as I can happily look up from my prone, broken body, towards that bobbing Spartan rear, safe in the knowledge that they are only jealous. After nipping down to see the boys in Cheltenham this weekend, I’ve been drawn into Battlefield: Bad Company. I’ve played the series before and whilst I enjoy the objective based gameplay my lack of a decent PC and my perceived quality of the console ports have kept me away in recent years. The good reviews of Bad Company were tempting but with crunch I appeared to have missed the window. What finally parted me with my money, however, was the quality of the audio. The battlefield really comes alive with a full 5.1 setup as the report of distant gunfire echoes across the huge playing area. Hearing the boom of a far off cannon and the rat-a-tat-tat of hidden rifles is stunning. When Halo 3 came out I did find myself immersed with the sounds of war all around Blood Gulch but that is nothing compared to the depths to which the sound engineers have managed to achieve with DICE’s latest outing. Beyond the sound, I’m enjoying the series with its classic dose of defend and attack. The only problem being that I have to severely curtail my instinct to run and gun as that it a sure fire way to get myself a body bag. I’m still holidaying, sorry, so no proper updates just yet. I’ve popped briefly back into work but most of my time has either been spent laying laminate or playing Trouble in Paradise. There is a part of my that is part amazed-part chuffed that after spending the best part of five years on those papery gits that I still love playing the game, clocking up about 80 hours so far and I’ve not even gotten my Fizzlybear yet. I guess not being directly involved in gameplay has helped but my workmates still think I’m mad. Anyway, I’m off to Halopalooza this weekend so as you can imagine I’m very exciteable. I’ll leave you with another video; no where near as exciting as the others but this is a Public Service Announcement for those VP players who can’t figure out Pinata Vision.